The birthplace of Yoga is said to be Nepal as Lord Shiva has given the lessons on Yoga (especially Ashtanga yoga) from the Mountain Kailās which is situated in Nepal. Lord Shiva is known as the inventor of Yoga which he taught to Goddess Parvati. She asks many questions regarding, yoga and other types of austerity with Lord Shiva. The conversation was taken place in Kailas Parvat (mountain). In her answer, Lord Shiva reveals the secrets of asanas, yoga and other hidden knowledge. These conversations can be found in different old epics, especially in Shiva Puran. Lord Shiva has revealed many secrets and depth of Yoga in the ancient epic. There were many Yogis who had been practicing yoga in Himalayans like Kailas parvat. We can still find some Yogi continuing yogic practice in the forest, mountains, and Himalayan of Nepal. Buddha was born at Lumbini in Nepal who taught equanimity followed by awareness throughout his life. The birthplace of Yoga is known to be in Nepal due to his birth in Nepal as well. The meditation techniques taught by Buddha is found to be the most scientific, natural and effective. His path is followed in all over the world. There were some people to get enlightenment before Gautama Buddha and after his physical life as well. But the maximum number of people who got enlightenment was in the time of Buddha. There were other techniques and spiritual master besides the Buddha, but history says that too many people got enlightenment during the period of Buddha through his meditation. Basically, he taught meditation in Northern India and in Nepal. Thus yogic knowledge was flourished from India as well. Patanjali has explained the Yoga dividing it into eight branches (Yama, Niyama, Asana, Pranayama, Pratyahara, Dharana, Dhyana, Samadhi). Actually, the birthplace of Patanjali is far from clear. Nor it is known where he lived and taught Yoga to the public. The language he used is in Sanskrit. And Sanskrit language has prevailed in Nepal and India. From this sense, the birthplace of Yoga can be regarded to these both countries. The practices of Yoga were begun in Nepal and India from the ancient time. Gradually, it was flourished all over the world. Hath Yoga has been developed from the concept of Patanjali. He introduced the systematic practice of Yoga which works on body, mind, and spirit simultaneously. Yogeswar (the lord of Yoga) Krishna was incarnated in Mathura, India. He has decoded eighteen types of Yoga in Bhagawat Geeta, when, Arjuna was refusing to fight the battle of Mahabharata. The place where Lord Krishna gave the knowledge of Bhagawat Geeta was in front of the worriers of Mahabharata, which was prevailed in Nepal and India. In the ancient time, Nepal and India were not in existence. These countries were divided into many small countries. And whatever the important factors, regarding Yoga, were taken place, those have happened within these place. After many years, Nepal and India got their identity in the form of a particular country. From this point of view, the birthplace of Yoga is sometimes said to be Nepal and India. The Yoga stated in Bhagawat Geeta is theoretically based. Bhagawat Geeta contains different 18 forms of yoga, which basically talks that yoga is the balance of mind rather than that of the body. It states that the equanimity of mind is called Yoga. The lord has given emphasis on Bhakti Yoga, Jnana Yoga, Karma Yoga etc. Among different types of Yoga, Hath Yoga begins with physical practices. In the ancient period, many people from India and Nepal practiced it and achieved accomplishment. These types of practices have been continuing in this modern period as well, in different places of Nepal. Since Nepal is the birthplace of Yoga, practicing Yoga in this place gives a better result. Nepal is the country of Himalayans and Yogis, wherein many ancient people had achieved perfection through the continuous austerity. The yogic vibration in Nepal is found to be comparatively more than in another part of the world. 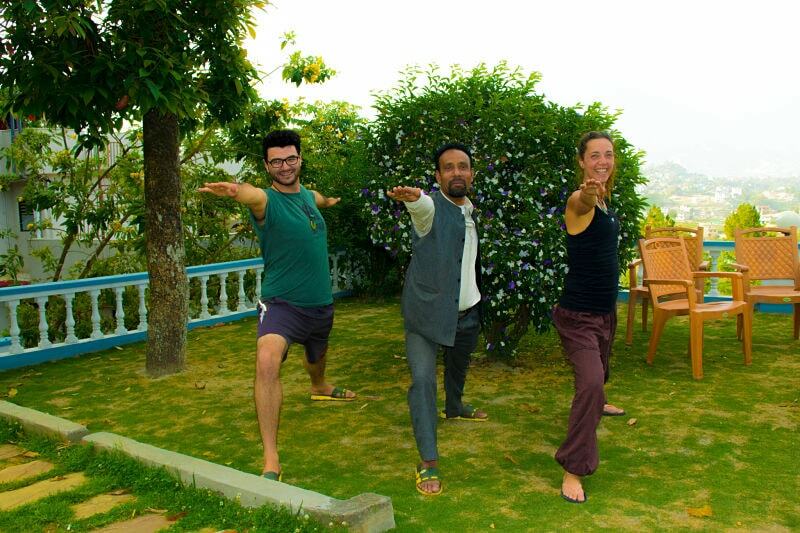 There are different yoga centers in Nepal wherein general yoga teaching, Yoga Teachers Training, Yoga Instructors Course, Therapeutic Yoga etc have been conducting. The environment and wave favor for Yoga and meditation. Many foreigners and natives have been practicing yoga, meditation, and other spiritual practices in the birthplace of Yoga i.e. Nepal and India. Many Yogis were born over here in the ancient time and this is continuing. King Janaka, Ashtavakra, Mahavatar Baba, Yukteshwar Giri, Yogananda, Ramakrishna Paramhamsha, Swami Ram Tirtha,Vivekananda, Yogi Naraharinath (who wrote over 600 books in 28 different language), Khaptad Baba, Osho, J. Krishnamurti, S.N. Goyanka etc. are some yogis who have been emphasis that this place is the birthplace of Yoga. Swami Kuvalayananda kept continuing the teaching of Yoga. Similarly, some of the Yogis like Chidananda Saraswati, Sivananda Saraswati, Satyananda Saraswati, Swami Rama, Dhirendra Brahmachari, Swami Veda Bharati, B. K. S. Iyengar , K. Pattabhi Jois have played a great role in flourishing the Yoga throughout the world making clear to all that the area of Nepal and India is the birthplace of Yoga. Their contribution will remain immortal and will sustain till the expiry of this world. The supreme knowledge that they offer to the people has taken the people to the path of welfare, perfection and finally towards the enlightenment. There are too many historical places which represent the remains of the ancient practice that were happened in Nepal and India. In some dense forest and mountain of these places, especially in Himalayan area there can be found some diggings and dwellings where past friar used to perform their spiritual practices. These vestiges signify the birthplace of Yoga is in the area with the boundary limited to Nepal and India.